Last week members of the Black Lives Matter (BLM) movement organized a small but long protest outside of City Hall in Cambridge, MA. Four members of the movement chained themselves to the front door for hours resulting in their eventual arrest. Rather than protesting police brutality however, they were protesting the lack of affordable housing in the city. Dominated by Harvard and MIT, housing in Cambridge has become a major issue for residents and students alike. The protesters posted 4 demands for affordable housing in the city during their protest. On a broader level, this shows what I believe to be a natural and hopeful extension of the BLM movement into addressing other forms of systemic racism. As I have written before, I believe our housing policies are the most dramatic and far-reaching form of systemic racism evident at all levels of government. We must address this legacy as a nation. Any reasonable person can see that the justice system has severe racial disparities and that the police in many communities have mistreated non-white residents. Coupled with the increased exposure to police violence captured on video and shared through social media, it made sense for BLM to emerge over this issue. There was a moral imperative to take action against such crimes, whether state-sanctioned or not. It’s not that any of these crimes are particularly new, but technology and the BLM movement have forced the nation to face up to them. You can argue over the efficacy of tactical decisions made by individual BLM movements and certainly some have been more effective than others, but that is to be expected in a broad, loosely linked social cause. In some cases, they have organized political candidates and voter-registration drives, in others, they have alienated presumed allies. At times it has been messy and even counter-productive, but I’m not here to discuss tactics or process in regards to the BLM’s actions, even in Cambridge. What interests me is the strategic shift that the Cambridge BLM protests represents. It’s a shift that I hope gets more attention in the press and gets more replication in the movement on a national level. I say this as an observer of the movement, one conscious of not claiming to speak for it, but I believe that BLM has always been about something larger than protesting police violence against communities of color, as important as that issue is, and this appears to be a pivot towards a larger vision of racial justice. To be clear, I don't know how much these particular activists have coordinated with other chapters, maybe they haven't, but I certainly hope that this is a signal of a new focus. What happened in Cambridge is an important and necessary step in the evolution of the movement. Just as Martin Luther King and his Southern Christian Leadership Conference “went north” to Chicago with the civil rights campaign in 1966 (with a particular focus on housing) perhaps BLM is having a similar expansion of its scope. 1. Suburban sprawl was a form of white supremacy. 2. Gentrification is just sprawl by another name. Many Americans still don’t realize that the great suburban expansion begun after WWII was a massive government-sponsored program, not an organic evolution of supply and demand. The US Government effectively placed two bets on the post-war economic prosperity of Americans – homeownership and car ownership. They ‘stacked the deck’ on these bets by paying for the construction of thousands of miles of interstate highways and local roads and by securing cheap gasoline through subsidizing domestic production and forging international alliances with Saudi Arabia and other oil-producing nations through billions of dollars in military aid. Just as consequently, they subsidized the housing industry by creating federal agencies to guarantee mortgages (Freddie Mac and Fannie Mae), which radically reduced the risk to banks and the cost to buyers. It was literally cheaper to buy a brand new house in Levittown, NY than to keep renting an old apartment in Queens. With the cost of constructing and buying a house radically reduced, and the cost of traveling to and from that house radically reduced, it’s no wonder millions of American’s moved to the suburbs. It was an economic no-brainer. And it was virtually unavailable to Americans who weren’t white. Most white American’s don’t realize that either. The resulting economic and social isolation have spanned generations and caused long-lasting damage to many minority communities. The impact of sprawl is so ubiquitous that we can’t even see it. For example, the demographics of urban American changed in unprecedented ways. In 1950, Detroit was the nation’s fifth largest city at 1.8 million people. At the time it was 84% white, 16% black. As of the 2010 census, it has lost 61% of its population. It’s now 10% white and 83% black (and 7% Hispanic). As the motor industry and whites left Detroit, black residents were left behind. The racial discrimination in law enforcement that BLM protests today has its roots in sprawl from this period. It wasn’t an accident or moral failing that the many black Americans became concentrated in poor, inner cities. They weren’t allowed to leave. (Although in many cases, including Detroit, many blacks were fleeing worse conditions in the Jim Crow South.) Even as the populations of these cities turned predominantly non-white, most law enforcement agencies retained their predominantly white makeup. That brings us to gentrification and the protests in Cambridge. Even though the ‘great urban migration’ is a bit of a myth, there are still a number of coastal cities experiencing a rapid shift in racial and economic characteristics in certain previously poor, minority-majority neighborhoods. A limited housing supply has run up against the concentration of certain high-growth jobs in these cities creating huge pressures on poorer residents and middle class residents to keep up. Although actual displacement is hard to measure in gentrifying neighborhoods, the simple truth is that most pre-existing residents of these neighborhoods are not benefiting from these changes - and most of these residents are minorities. Sprawl has found its way back into the city. Boston (Cambridge is just across the river) is a prime example. With firms like General Electric relocating to be closer to where workers are and where they want to live, there is huge pressure on the housing supply in greater Boston. Housing costs have skyrocketed over the last 5 years by more than 50% and now a single-family home in Cambridge costs over $740,000 and a one-bedroom rental is $2300. Affordable housing is a moral issue, one steeped in racial injustice. And though this clearly informed the Cambridge BLM protest, the group outlined detailed if modest goals, perhaps surprising to some given the coverage over the protest itself. The group wants the City Council to require any developer to set aside 25% of units for affordable housing; to allow MIT to build more student housing to relieve pressure on the market; to use public land like parking lots for affordable housing construction; and to establish a rent-to-own program. This chapter of BLM clearly has a deep understanding of the housing needs of the city and the political realities surrounding the major educational institutions that anchor it. If this represents the beginning of a broader effort by the movement to address housing discrimination and affordable housing policies, then it is as thoughtful as it is exciting. 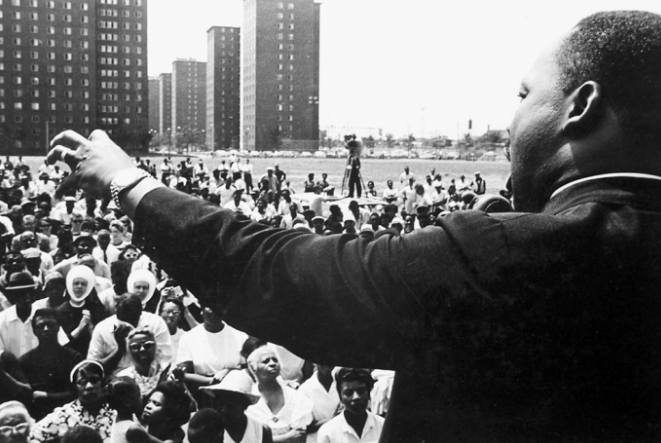 MLK’s northern campaign in Chicago should serve as both a positive example and a cautionary tale for BLM. The SCLC was able to secure meaningful commitments from Mayor Daley over more public housing construction and more access to mortgages for black homebuyers. These were significant victories that had a direct impact on the passage of Fair Housing Act two years later (but after MLK's assassination) that formalized many of the same policy goals on a national level. However, as the Vietnam War began to take center stage in the nation’s political consciousness, the movement was unable to retain focus and cohesion on many issues. The violence and poverty that has gripped much of Chicago today (which has inspired a strong response from community members and the BLM alike) attest to the work that was left undone. Hopefully there is another opportunity emerging to continue the work against racial discrimination in all facets of American life.